(Natural News) Former bartender-turned-Democratic House Representative Alexandria Ocasio-Cortez (Communist-N.Y.) is upset that Facebook, Google, and other tech giants are sponsoring an upcoming conference about climate change that – gasp! – will feature speakers on both sides of the climate debate. In a letter she recently wrote with the help of Maine Representative Chellie Pingree (D-Maine), Ocasio-Cortez wrist-slapped Big Tech for daring to not only promote climate free speech, but also to help fund it. “We are writing to you today in light of the important role that your companies play as we prepare to take comprehensive action on climate change,” the letter reads – its implication being that Big Tech has a duty to censor free speech about climate change that goes against the globalist narrative. “Disappointingly, though, the example you have set promoting sustainability and evidence-based science is compromised by your implicit support of the session organized at LibertyCon,” it goes on to say, LibertyCon being the name of the conference. For more related news about the Leftist obsession with pushing climate paranoia, be sure to check out ClimateAlarmism.news. It’s no longer a secret that the Left Cult’s version of “free speech” entails only speech that’s approved as acceptable and valid by Leftists. All other forms of speech are now considered to be “hate” speech, and must be silenced and banned. 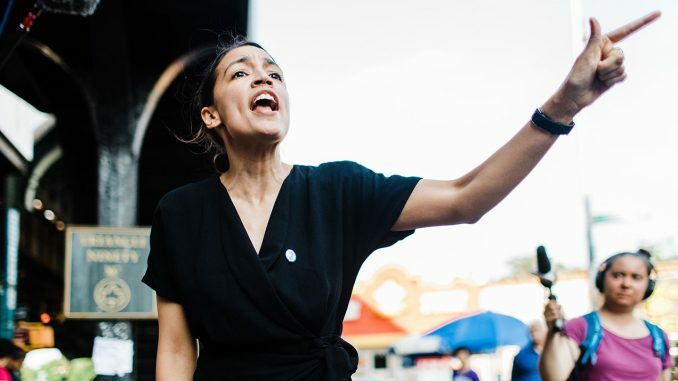 In this case, the “hate” speech that Occasional-Cortex is offended by would seem to extend far beyond just opposing viewpoints on climate change. As reported by The Hill, other talks at LibertyCon that appear to have triggered AOC include, “Fake News and What to do About It,” “Is the Internet Still a Free-Play Zone?” and the particularly triggering “Socialism is Evil” event, which will challenge the cultural Marxism that AOC actively promotes. Socialism is AOC’s middle name, so it’s no surprise that she’s opposed to any discussion of it in a negative light – not to mention that the name of the conference, LibertyCon, contains the word liberty, which stands in absolute opposition to AOC’s vision for America. Surprisingly, both Facebook and Google defended their support for LibertyCon, despite the nagging correspondence they received from AOC and Pingree. “Sometimes we support events that highlight Internet and social media issues,” was Facebook’s response to the letter. “For the past decade, we’ve reduced emissions, invested in renewable energy, supported policies to address climate change and enabled people around the globe to use technology to accelerate progress on this issue,” the statement further reads. For more news about actual climate science that’s not tainted by special interests, be sure to check out ClimateScienceNews.com. Why Is It That Those Who Expose “Deep State” Actors End Up Meeting An Untimely, Convenient, Demise?